Unusual horse art to say the least! What an amazing image! 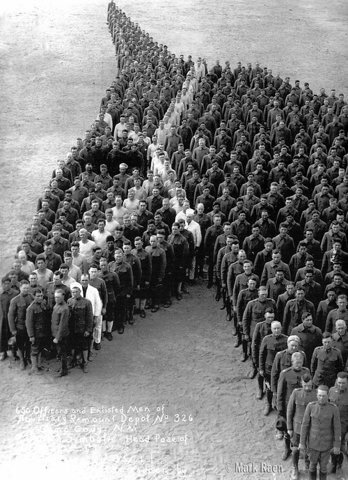 650 officers and enlisted men of Auxiliary Remount Depot No 326, a Cavalry unit, created this human representation of a horse head. Fresians long lining in tandem – way cool! Do you know the date of this photograph or the location? It looks vintage WWI. Very cool! Would Love to buy a printer of this picture.. Any ideas?? The photograph is part of the Library of Congress Collection. You can download it from here: http://www.loc.gov/pictures/item/2018646141/. The image there isn’t huge, but it has a good amount of detail. This needs a *like* button. LIKE! If you download the photo from the website, you can have your own print made. I’m one of those People who only knows enough to get in trouble.. Please tell me step by step how to do That, please. Thanks! I love it when readers can chime in and help give context to the photos. Want to buy the print of this picture, please!! So how do I go about buying a Print of these HEROS!!?!? I wish I knew. I’ll see if I can find out if it was ever made into a print. I would like to use this photo on the cover of an equestrian magazine to commemorate the ANZAC contribution/the horses. Who do i talk to about this ? The best information that I can find on the photo is this. Since the image was taken before 1923, it is in the public domain so it should be possible for you to use it along with credit to the photographer. Calvary Unit in Camp Cody, NM posed to represent the head of the saddle horse of commander Frank G. Brewer. It was a tribute to horses, donkeys and mules that died during the war. Research dates the photo to around 1917.